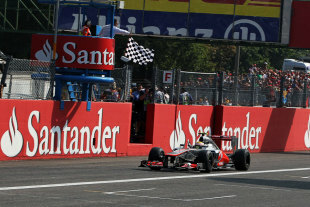 Lewis Hamilton won a compelling Italian Grand Prix in which both Jenson Button and Sebastian Vettel retired while Sergio Perez came from 12th on the grid to finish second. Hamilton dominated the race throughout with the action taking place behind him, but Perez, the star performer, finished just 4.3s behind at the end of the race. Fernando Alonso finished third after starting from tenth and couldn't stop Perez passing him seven laps from the end of the race. Felipe Massa finished fourth after playing a dutiful role for Ferrari, splitting the McLarens at the start and then making way for Alonso midway through the race. Kimi Raikkonen finished fifth, the only other championship contender to make the chequered flag as Mark Webber retired two laps from the end. Michael Schumacher finished close behind Raikkonen in sixth place ahead of his team-mate Nico Rosberg, Paul di Resta, Kamui Kobayashi and Bruno Senna. The start of the race saw Hamilton get away well but Massa beat Button off the line for second. Massa had a look around the outside in to turn one but thought better of it as the whole field was cautious on the opening lap. Alonso's race was set up when he made progress early on to pass Kobayashi in to Parabolica at the end of lap one, and then took Raikkonen before the next corner to run sixth. Schumacher dropped behind Vettel and Alonso by lap seven as the DRS and tow opened up plenty of overtaking opportunities. Jean-Eric Vergne was the first casualty of the day when he appeared to have a failure at the rear of his car under braking for turn one and flying across the kerbs in to retirement. Strategy was key once again as the Mercedes and Raikkonen pitted early, and Perez started to inherit places as he ran long on the hard tyre having started 12th. At the front Button passed Massa on lap 19 in to the Roggia chicane and after Massa rejoined in traffic after his pit stop Button was able to come out in clear air despite a slow stop. Perez had made progress to lead by the time the pit stops had all shaken out, but a key moment unfolded behind him as Alonso attacked Vettel. Having got a slipstream in to Curva Grande Alonso tried to go around the outside of the Red Bull, but Vettel eased him off the road on the grass in a more robust fashion than when roles were reversed 12 months previously. Alonso made it through two laps later, but Vettel was still hit with a drive-through penalty that dropped him to ninth. As the penalty was handed out, Button's race came to an abrupt end with a loss of drive on the run to Parabolica, promoting Massa to second and Alonso to third as Vettel rejoined behind Webber in ninth. Having lost out to his team-mate, Webber was then told to be aware that Vettel had "a car problem that could cause him to stop suddenly", with Vettel eventually retiring with an apparent alternator failure with six laps to go. With Massa having been ahead of Alonso, the inevitable switch of positions happened, but not before Perez had emerged as a threat after he started making progress on the medium tyre having extended his first stint to lap 29. Having passed Raikkonen with a strong move in to the first chicane, Perez set off after the Ferraris and reeled them in at over two seconds per lap. Perez eased past both Massa and Alonso - even travelling quickly enough to worry McLaren sufficiently to tell Hamilton to up his pace - and closed the gap from 20s to 4.3s by the chequered flag. Despite dropping to third, Alonso's day got even better as Webber had a high-speed spin exiting Ascari and flat-spotted his tyres so badly that he had to cruise to the pits and retire with two laps remaining. The result sees Hamilton close to within 37 points of Alonso, but the fact that he's now the second-placed man in the standings means it was a great day for the championship leader.